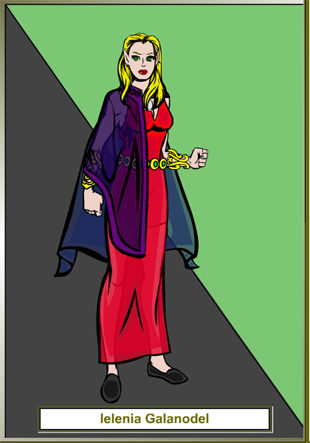 Description: Ielenia is a beautiful young (120 age) elf, with flowing long golden blonde hair, large emerald green eyes. 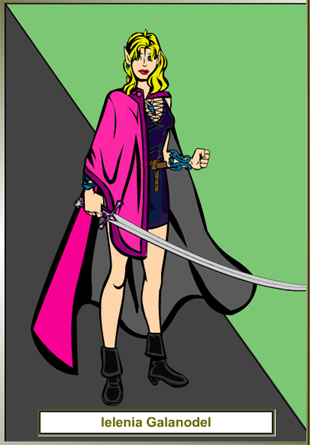 Her form is shapely & lithe, yet with well toned muscles (due to her extensive training with Sword Dancing). She tends to dress alluring in silks and satins, and seems to have no modesty as she feels as comfortable naked as clothed. On her right thigh is a tattoo of a small bull and tiger struggling. History and Personality: Ielenia was taken at the age of 73 from her village, child of slavery most her growing years . Her formative years where spent in the arenas as well as in the brothels. She has little concern over taking a life, yet seems to have a child like naiveté when it comes to the world around her. She understands the effects she causes men (or some women for that matter), and isn't afraid to use that to her advantage in or out of a fight. She desperately longs to find her parents but has no idea where her village was, or for that matter where she is relative to it. Threatening her brings out a cold eyed killer, while questioning her seems to bring out a innocent child who is hurt easily, though her hurt can turn to rage very fast to those she doesn't consider friends. Earned a title of Baroness (of Raven's Cross) when she and the party killed a red dragon on the border. Her Elven Fiancé (Elewyn Lark, grey elf, minor prince) has taken up her schooling in elven culture and high society. Their marriage is planned for less than a decade away scandalizing elven noblility at the rush.